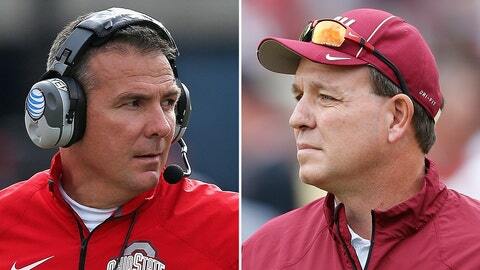 Ohio State coach Urban Meyer (left) and Florida State's Jimbo Fisher need not worry about the SEC — so long as they keep winning . . . trust us. 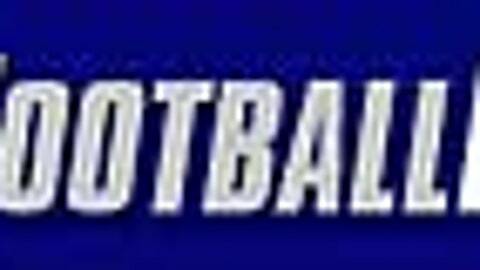 The seventh BCS standings are out, and we start with the end . . .
Let’s stop this right here, right now. It might make for fun and interesting copy to suggest that a one-loss SEC champion could get into the BCS Championship Game over an unbeaten Ohio State, but it’s never — ever — going to happen. As long as Florida State and Ohio State are in the top two in both human polls, that’s it. It’s over. Some of the computers might like an Auburn or a Missouri — or a Northern Illinois for that matter — but the computer formulas tend to like unbeaten teams even more. In the end, if there are two undefeated teams from BCS conferences, there’s your national championship matchup. Florida State is No. 1, Ohio State is 2 in the coaches’ and Harris polls, and they’re that way according to the computers, too. And that’s not going to change now. Victory in the ACC and Big Ten championship games is all that matters, not margin of victory; win and get in. In the long and glorious history of the BCS, no one-loss team has ever made it into the championship game over an unbeaten BCS conference team, and considering Ohio State started out the year No. 2 in the coaches’ poll, and throwing into the mix the unbeaten record over the last two seasons under Urban Meyer, SEC fans, you need to start caring about Michigan State in a big, big way. If Ohio State loses to Michigan State, then the Auburn-Missouri winner in the SEC championship game will play for the national title. So no, No. 5 Missouri won’t be left out if it beats No. 3 Auburn; the one-loss SEC champion is on top of the one-loss pecking order, regardless of the name of that school. Buuuuut . . . If Michigan State beats Ohio State and Duke pulls off the shocker of all historical ACC shockers in the championship game, beating Florida State . . . then yes, the Alabama Crimson Tide would almost certainly move up from No. 4 into the top two to face the SEC champion in the BCS Championship Game. Why? Florida State losing to Duke would be Florida State losing to Duke — there wouldn’t be any respect left for the ‘Noles. The Buckeyes are already getting dogged for their weak schedule, and losing to the Spartans would be a killer in the human polls. Spartan fans, go ahead and book your tickets to Pasadena. Wisconsin probably wasn’t as close to being in the BCS at-large mix as many made it out to be, but the Badgers would have certainly been a factor with a 10-2 record. But after that bizarre performance in the upset loss at the hands of Penn State, Wisconsin is out and Michigan State is all but certain to get into the BCS, regardless of what happens in the Big Ten title game. If the Spartans beat the Buckeyes in Indianapolis on Saturday, then they’re in Rose Bowl as Big Ten champions. If they lose to the Buckeyes, as long as they don’t get obliterated in embarrassing fashion, Ohio State will be in the BCS Championship Game and, assuming Florida State takes care of business against Duke, the Rose Bowl will get the second pick of at-large teams after the Orange. After losing Florida State to the BCS Championship Game, the Orange would almost certainly want a one-loss Alabama from the at-large pool. The Rose Bowl loves the Big Ten/Pac-12 matchup no matter who is in the pool, and it would be a total and complete shocker if Michigan State was not off to its first BCS-level bowl, and first Rose Bowl since Jan. 1, 1988. And not to be lost in the shuffle, Michigan State up to 10 in the BCS standings is also a big help for . . . The Buckeyes will play for the BCS championship as long as they’re 13-0, but it would be nice to have a little more support considering the strength of schedule is a disaster. Yes, if it was so easy, everyone would go 12-0 against mediocre schedules. But as bad as it might look, OSU still has wins over five bowl-bound teams — Buffalo, San Diego State, Wisconsin, Iowa and Michigan — along with a win over a Penn State team that would’ve gone bowling if eligible. Sure, beating bowl teams isn’t that big a deal, and there isn’t a killer win on the slate, but if the Buckeyes can get by Michigan State, the schedule isn’t nearly as miserable as the stats make it appear. Would Ohio State be unbeaten if it played in the SEC? Probably not, but that’s not the way the pre-playoff, BCS world works. And hey, at least the Buckeyes’ schedule isn’t as bad as . . .
It’s hard to fault any BCS conference team that’s 12-0 with each win a laugher, but let’s take a look at the teams the Seminoles have blasted week after week. The closest call so far this season was a 48-34 win over Boston College in September. The second-closest game was the 27-point win over Miami on Nov. 2, and No. 3 was the 28-point blowout of Pitt in the opening weekend. However, the Seminoles have just one truly strong win, beating then-No. 3 Clemson 51-14 in Death Valley on Oct. 19, and overall they have four wins over certainly bowl-bound teams — Boston College, Maryland, Clemson and Miami — and wins over Pitt and Syracuse teams sitting at 6-6 and hoping for a bowl slot. Again, there’s no arguing with the results for a team that’s playing this well, but while Ohio State is the team getting destroyed by the SEC schedule lovers, Florida State’s slate deserves the same scrutiny. Clemson’s six-turnover problem in the loss to South Carolina on Saturday was a disaster for the ACC. The Tigers fell from No. 6 in last week’s standings to No. 13, and outside of No. 1 Florida State, Duke at 20 is the only other ACC team in the BCS top 25. It seemed like a foregone conclusion that Clemson would be the second ACC team in the BCS, but now it’ll take something special — like Duke beating the Seminoles — for anyone else to get in. The Cowboys’ coaches and players can talk all they want about how the team started to come together and was more focused after losing at West Virginia in late September, but there’s no way to spin it in a positive manner — the ugly defeat probably cost Oklahoma State a shot at the national title. Mississippi State might not be a world-beater, but it’s going to a bowl game and Oklahoma State’s 21-3 victory over the Bulldogs in the opener is an SEC victory for the résumé that Ohio State doesn’t have. Blowing away an unbeaten Baylor is more impressive than anything the Buckeyes have done, and coming up with wins over Kansas State, Texas Tech and Texas are solid, if not spectacular. An impressive win over Oklahoma on Saturday could make this one of the top one-loss teams in the BCS. However, West Virginia closed out the season with losses to woeful Kansas and Iowa State teams, wrapping up a run of six losses in the season’s final seven games after the win over the Cowboys. If OSU can beat the Sooners, it’ll move up to No. 5 ahead of the SEC championship game loser, and it could move up a wee bit higher if Florida State or Ohio State lose — but it can’t get to No. 2. With Fresno State’s loss to San Jose State, Northern Illinois stands as the lone non-BCS conference school with a shot at a BCS bowl game. Sitting at No. 14 and ahead of No. 16 Central Florida, the Huskies have a BCS spot all to themselves if they can get by Bowling Green in the MAC championship game on Friday. The Huskies have to be in the top 16 and ahead of a BCS conference champion, or they have to be in the top 12 to get an automatic bid. There’s a chance to move up a wee bit if No. 11 Arizona State and/or No. 9 Baylor and No. 10 Michigan State lose, but everything should be fine for NIU with a win and the current standing over UCF. The Huskies would take away a second at-large bid from either the ACC or Pac-12, meaning . . .